spinothalamic tract represented by the purple nerve fiber traveling up from the spinal cord, through the medulla, and to the thalamus. 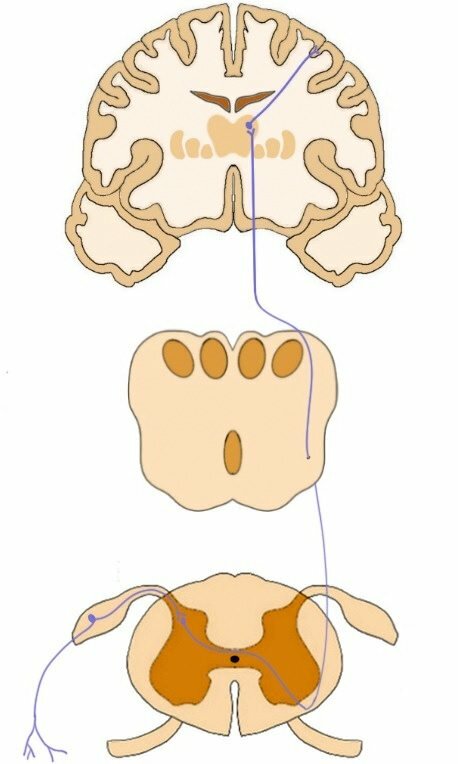 in the thalamus the fibers synapse with thalamic neurons that carry the signal to the somatosensory cortex..
contains fibers from the posterior horn of the spinal cord that carry information regarding pain and temperature to the thalamus. Watch this 2-Minute Neuroscience video to learn more about the spinothalamic tract.